Durable, lightweight, aluminum design with a curved and padded backrest for comfort while seated. Flip-up, cushioned seat with a convenient and discreet nylon storage pouch. Secure bicycle-style, loop-back handbrakes with angled handgrips. Folds easily for compact storage and transportation. 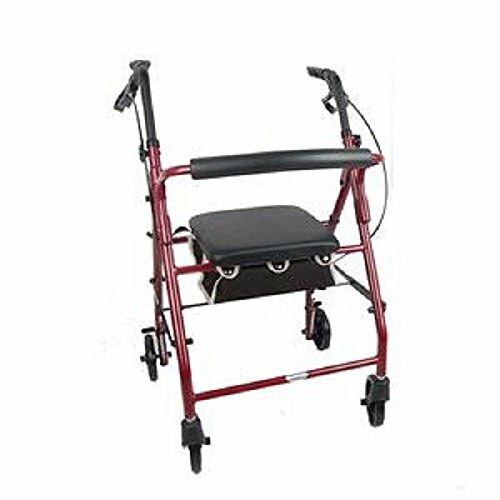 Wheel size: 6" ◾Overall width: 24" ◾Seat height: 21-1/2" ◾Seat dimensions: 12-1/2" x 12-1/4" ◾Handle height: 32-1/2" to 37"
If you have any questions about this product by Medical Supply Team, contact us by completing and submitting the form below. If you are looking for a specif part number, please include it with your message.